Angela Merkel will be the German Chancellor for a fourth term now that her CDU/CSU bloc has won the parliamentary election. However, her political future is not at all cloudless amid the Social Democrats declaring opposition and a nationalist party to the right of the CDU/CSU entering the Bundestag for the first time since the 1940's. Russian Foreign Minister Sergei Lavrov's recent talk at the Koerber Foundation in Berlin was a useful chance to get Russia's point of view across to German politicians and journalists, political commentator Alexander Rahr told Sputnik. 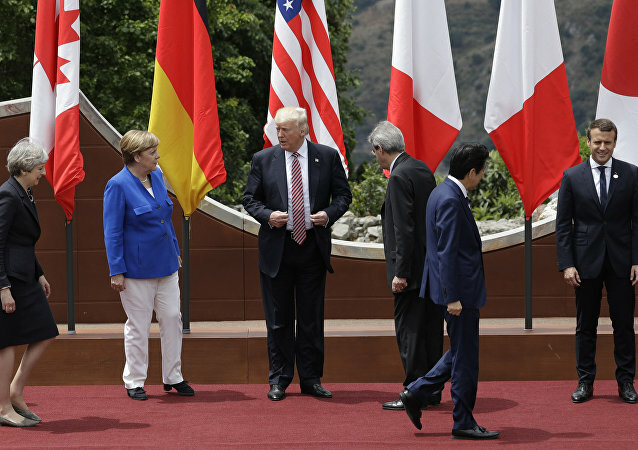 Commenting on the results of the G7 Summit in the Sicilian city of Taormina, Italy, and the remarks of Chancellor Merkel that Europe "must now take its fate into its own hands", German political analyst Alexander Rahr suggested that it is a chance for the Europeans to stop hiding behind the US and start working on their own policies. Recent speculation over new anti-Russian sanctions set to be imposed by Angela Merkel's cabinet looks more like a "provocative information hoax" and a way for the US to put pressure on its European partners, according to political analysts, who explain why it is highly unlikely that the EU will introduce any new punitive measures on Moscow. The deadly Munich attack is likely to affect the German political landscape: following the tragedy voices have emerged blaming the incident on German Chancellor Angela Merkel's policies. Does that mean Merkel stands a chance of losing in a 2017 national federal election? The European security system has to be fixed with the help of the OSCE, said Alexander Rahr, a member of Germany’s Foreign Policy Council. The European Union has turned into a 'chicken coop where the chickens have scattered in all directions', says German political scientist Alexander Rahr, commenting on the implications of the results of the Dutch referendum on the EU-Ukraine Association Agreement.